UPDATE: New Information on Babe’s Departure Point from the U.S.
A. Camp Wheeler (Macon, Ga.); B. Transfer, Pa. (Shenango Personnel Replacement Depot); C. Newport News, Va.
A few days ago, I tried to piece together the places Babe went between basic training in Camp Wheeler, Ga., and departing for North Africa. I speculated that his last stop was Camp Shanks in New York, based on reports I’d seen indicating that camp was a popular port of departure for soldiers headed to Europe and North Africa. I said it was a guess when I wrote it. But now I know I was wrong. Since posting that item, I’ve gotten new information. Babe went from Pennsylvania to the naval station at Newport News, Va., then on a seven-day voyage to Casablanca. Here’s how I learned that new tidbit. The Conte name was familiar to me. As a kid, we’d always visit Conte’s Fish Market in Mount Kisco for clams on the half shell. I didn’t know anyone in the family personally, but my uncles Bob and Vince (Babe’s brothers), my grandmother Florence and my mother knew them. So I emailed Rob Conte at Conte’s Fish Market. That led me to Pia and Luca Edward Conte, siblings whose father, Luca George Conte, was on board the boat with Babe. Luca George went by the nickname “Lugi,” according to his daughter Pia. 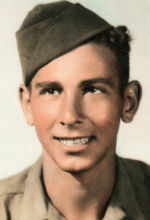 The son, Luca Edward, now of Louisville, Ky., also sent a summary of his father’s service that noted some key facts: He also left the United States on July 14, 1943, and arrived in North Africa on July 21, 1943, just like Babe, corroborating Babe’s comment that he met Lugi “on the boat coming over.” Based on Lugi’s recollection, in the document his son sent me, they left from Newport News, Va., and arrived in Casablanca. I love how these pieces fall into place as you triangulate new information. And I’m grateful for the response from Pia and Luca Conte. I’ll be eager to share more information on their father in later posts. Good to see our names in print!!! Just one correction however; my father would turn over in his grave if anyone ever referred to him as Luigi!!! He insisted on being called Luca, and never liked it when people took liberties to call him Luke, or Louis or any Italian version like Luigi. It’s likely Frank mistook his name when introduced, or just got it wrong, which is likely since I usually have to repeat my name once or twice to newbies. Thought I should mention this now before my siblings start emailing us both! Perhaps I assumed that she meant he sanctioned that nickname; but you seem to be saying it was an unwelcome nickname. I initially thought Babe had written “Luigi,” and based on your sister’s note, I realized it was just “Lugi,” without the extra I. But if she’s mistaken as well, I’m happy to have the new information. I’ll be sure to refer to him as Luca George going forward.